Who doesn’t love a simple, light pasta dish on warm summer days? This satisfying meal is very easy to make and comes together quickly. 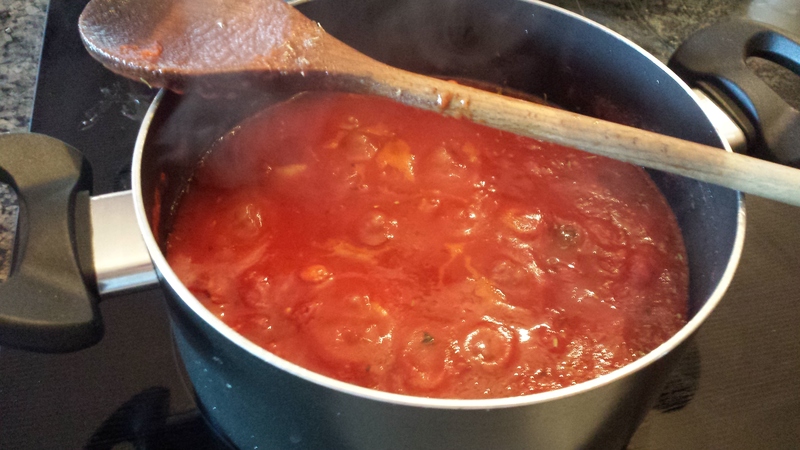 I will also share my quick and easy marinara sauce recipe (below), and I guarantee that once you try my recipe, you won’t ever open a jar of sauce again! Set a saute pan over medium-high set and coat the bottom with olive oil. Finely chop the onion and add to the pan with the minced garlic. Cook together until the onions become soft and translucent. Add the herbs and cook for about 1 minute. Add the tomato sauce and diced tomatoes and stir to combine. Lower heat to medium and let the sauce come to a boil. Chop the fresh basil into ribbons and add the to sauce, along with the sugar, salt and pepper. Adjust seasonings as necessary. Let the sauce simmer on low for about 15 minutes. 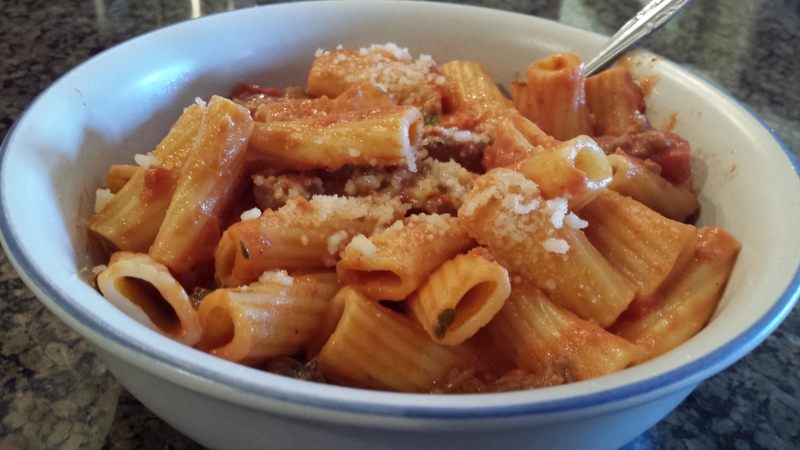 While the sauce simmers and gets thicker, start the recipe for the Rigatoni Fiesolana. First, brown the sausage. I used a 1-pound pack of sweet sausage, but this recipe is super versatile and you could add a mix of sweet and spicy, or even turkey or chicken sausage. The original recipe calls for 1/2 a pound of meat, but I know my family and they are carnivores! This amount did not overwhelm the pasta dish, I actually think that 1/2 a pound is too little. To brown, add a little olive oil to the bottom of a pot and set to medium-high heat. 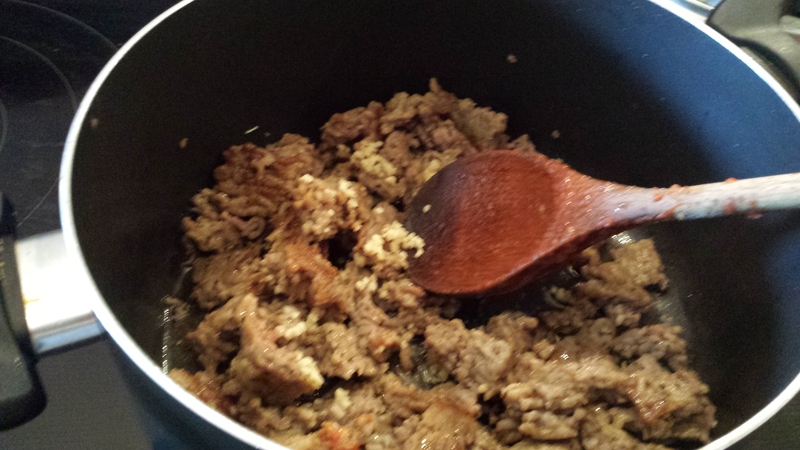 Get the sausage in the pot and break apart with a wooden spoon. After about 7 minutes, the sausage should be fully cooked. Add about one tablespoon of minced garlic, or two fresh small garlic cloves that have been chopped up very fine. Cook the garlic with the sausage for about one minute, and mix together. Next, chop the mushrooms into small diced pieces and add to the sausage mixture. I used two small portobello mushroom caps, but I think next time I will use an 8-oz pack of sliced baby portobellos instead to add more mushrooms to the mixture. 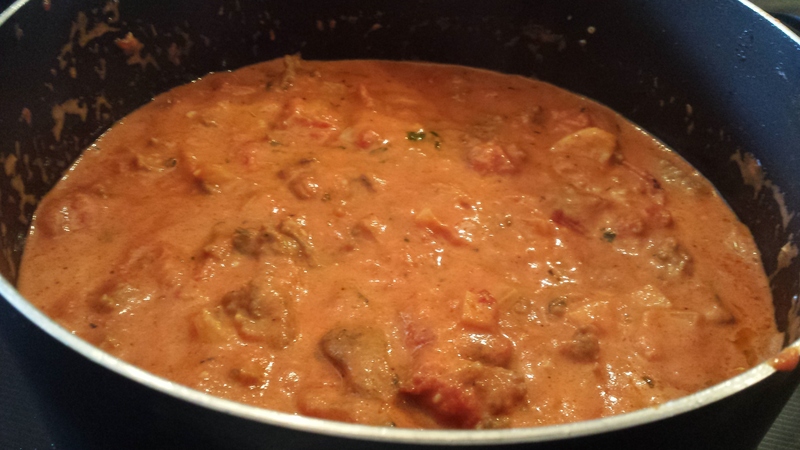 Cook until the mushrooms are soft and wilted, or for about 5-7 minutes. Season with salt and pepper. 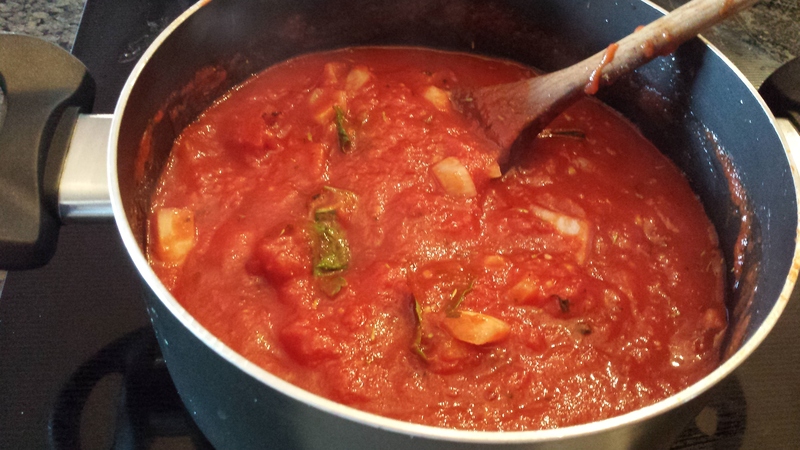 Watch as the bright red sauce turns into a soft, pinkish color. Doesn’t that just look super fancy! It actually isn’t a heavy sauce, but this trick is good to keep in your back pocket if you’re inviting people over for a pasta dinner. The appearance is key, and they will be expecting a red sauce, so surprise them! 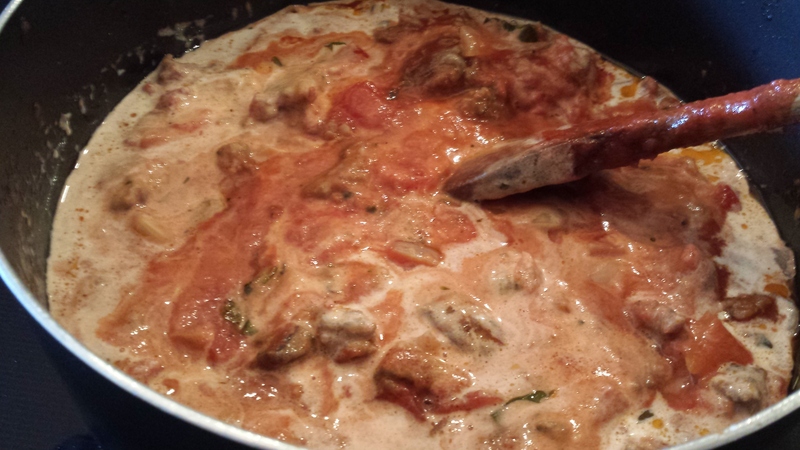 While the yummy sauce and sausage mixture get friendly, lower the heat to medium to bring it to a soft simmer. At this point, the stubborn and always last-to-the-party water should be boiling. Add salt to the water and the rigatoni. Cook until al dente or your preference. 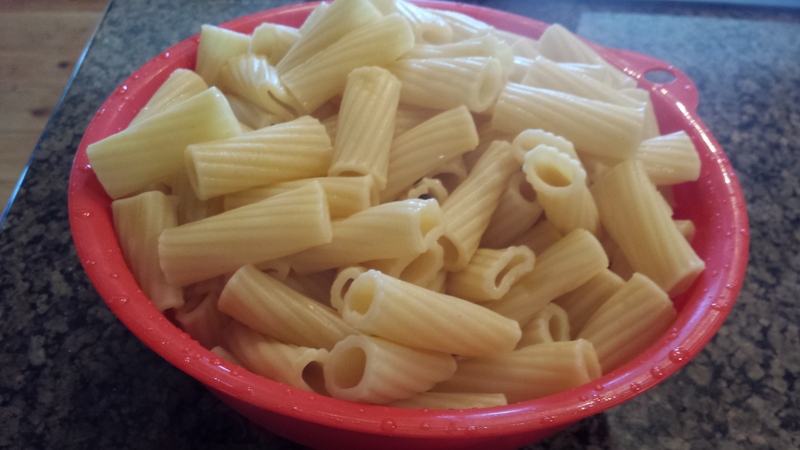 Is there a lovelier site than that of a bowl of pasta? TIP: Do not add the pasta to the sauce. The noodles have a tendency to soak up all the sauce, and the next day your leftovers (if there are any!) will be dry. Keep them separated. Top your pasta with some extra cheese, because why not it’s your dinner, and dive into the surprisingly light yet indulgently tasty meal you have rewarded yourself with! Enjoy! This recipe can be enjoyed at Spoodles on the Boardwalk at WDW. For the original recipe, click here.